With Star Wars: The Force Awakens' epic theatrical run winding down, fans can bring this box office blockbuster home on Digital HD April 1, before the Blu-ray and DVD release on April 5. Among the many bonus features available on these discs are a number of deleted scenes, and today, the Star Wars YouTube channel released a brief teaser from some of this footage that wasn't included in the theatrical cut. The deleted scenes on the Blu-ray and DVD include "Finn and the Villager," "Jakku Message," "X-Wings Prepare for Lightspeed," "Kylo Searches The Falcon," "Snow Speeder Chase," and "Finn Will Be Fine." This teaser opens with the villainous Kylo Ren (Adam Driver) entering the Millennium Falcon. We reported yesterday that this deleted scene takes place after the Falcon crash lands on the massive Starkiller Base. 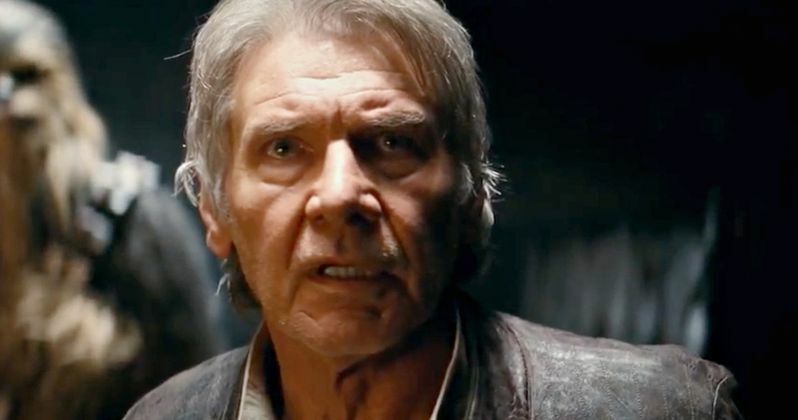 This preview also teases another deleted scene featuring Han Solo (Harrison Ford), Finn (John Boyega), Chewbacca (Peter Mayhew) and Maz Kanata (Lupita Nyong'o) as they try to escape the castle, but are ambushed by Stormtroopers. Back in January, special effects supervisor Chris Corbould teased details of a deleted scene where Maz Kanata leads Han, Finn and Chewie through underground tunnels of her castle, which is clearly part of the scene we see in this teaser. What we don't see in the video is that Maz actually uses her powers to "collapse the ceiling" on these Stormtroopers, teasing that this diminutive character is actually quite strong with The Force. While we only see brief snippets of other deleted scenes in this video, our report from yesterday reveals plenty of additional details about these scenes. The first scene on the Blu-ray is titled Finn and the Villager. FN-2187 has not yet gone AWOL, but Finn is not sure about the First Order. As the troops round up the villagers during their raid on Lor San Tekka's village, a conscience-stricken Finn has an intense moment with a woman hiding in the shadows of a small building. He's ordered to kill her. As he raises his weapon, he decided he must take a stand against his oppressors and fight the greater good. You'll have to watch the scene to find out how this moment ends. There is a moment that got cut out of the final movie which features Chewbacca ripping the arms off of Unkar Plutt inside Maz's castle when the Jakku junk boss comes to collect Rey. We're not sure if this scene will be included here. Other deleted scenes include Jakku Message, which introduces Carrie Fisher's General Leia earlier in the movie. She must decide her next move after The First Order has massacred the innocent bystanders in Lor San Tekka's village, and Poe has been captured. There is also a Snowspeeder Chase, where Finn and Rey hijack a Snowspeeder while on the Starkiller Base, with a Snowtrooper goes after them. This scene shows how the pair wound up in the woods for their snowy fight against Kylo Ren. The final deleted scene entitled Finn will be Fine shows Rey back at the Resistance base, where she gets an update on Finn's condition after being struck in the back by Kylo's lightsaber. We actually get to see some of that scene in this sneak peek. Take a look at this new preview before Star Wars: The Force Awakens debuts on Digital HD April 1, and Blu-ray and DVD April 5.